Casentino is located in the province of Arezzo and its landscape is characterized by large woods on the mountains and flats and hills in the valley bottom. The area is rich in nature and history. Casentino hosts the Foreste Casentinesi National Park and is one of the most important religious destinations in Tuscany. In fact, the Holy Hermitage and Monastery of Camaldoli and the Franciscan Sanctuary of La Verna, where Saint Francis got the stigmata, are both in this area. Casentino is rich in history and legends and was set of numerous battles. Here was fought the famous and bloody Battle of Campaldino between Guelph and Ghibelline where also Dante Alighieri fought. Legend has it that on every June 11th, the battle's anniversary, on the battle field of Campladino the ghosts of dead knights appear. Someone says that you can even see stones flying as it used to be during the battle. There are 13 municipalities in Casentino that form the Comunità Montana del Casentino. 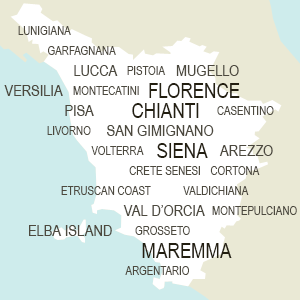 Main destinations here include Poppi, Bibbiena, Pratovecchio, Stia and Chiusi della Verna.